Bonfire is the first novel by Krysten Ritter, star of such excellent television shows as The B in Apartment 33 and of course Jessica Jones. This story takes place in the small town of our protagonist Abby Williams' childhood, where a 10 year old mystery disappearance has plagued the minds of every Barrens, Indiana townsperson. Back in town for the first time in 10 years as a grown up lawyer person investigating the potential water pollution of the local massive plastics firm, Abby digs up both the town's and her own past. While Abby investigates Optimal Plastics' layers of lies and cover ups, she also finds herself unearthing secrets about the decades old scandalous disappearance of popular girl Kaycee Mitchell, striking up romances with former classmates, navigating the complicated relationship with her ageing father, and attempting not to turn to drink as the impact of her childhood weighs down on her all the while trying to keep herself together in front of her colleagues. Ritter thanks Lauren Oliver in her acknowledgments, and as a fan of Oliver's writing I could really see her influence on this thriller. I love Lauren Oliver's books so this was definitely a good thing. Bonfire is dark, a little depressing, enthralling and gripping. I entirely pictured Abby as Krysten Ritter/Jessica Jones- maybe there could be a new series in this? Badass environmental lawyer with gay black colleague uncovering corporate scandals and solving murders? I'm on board! This gripping thriller is perfect to keep you curled up where it's safe and warm indoors this autumn/winter. I'm looking forward to seeing what Krysten Ritter writes next! 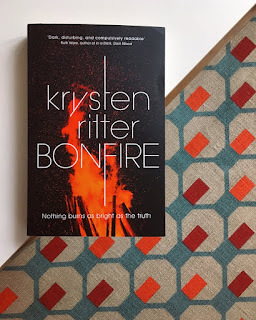 I received a copy of Bonfire from the publisher in exchange for an honest review, which this is! 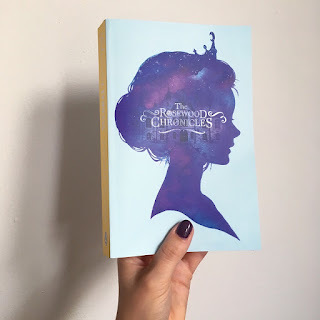 Undercover Princess is the first book by Connie Glynn, noodlerella on youtube, and the first part in The Rosewood Chronicles series. Our main character is the rather cutely named Lottie Pumpkin who earns herself a scholarship/bursary place at Rosewood Hall, a very prestigious private boarding school for heirs and royalty. Lottie has worked very hard to fulfil her mother's dying wish that she go to Rosewood Hall, so she leaves behind her quiet life in Cornwall with her slightly evil, possibly just antagonistic, step mum and best boy-pal, to attend the fancy school. Lottie is also very into princesses, pink, and tiaras and much to her surprise ends up sharing a dorm room with an actual princess, the mysterious Ellie Wolf, Crown Princess of Maradova. Ellie has not yet been presented publicly as the heir to the throne, so she is attempting to keep her royalty undercover. As gossip spreads about there being a princess at school, Lottie ends up pretending to be the undercover princess, to help her new pal out, and to indulge a little in her fairytale princess dream. I was really intrigued by the concept of an undercover princess, and as a fan of The Princess Diaries I was right up for the modern-European-princess-at-high-school set up (hello Princess of Maradova/Princess of Genovia.) And as a lover of She's The Man I was all for some undercover at boarding school action. There is a fun gang of friends from day 1 at Rosewood, with various geniuses, heirs to fortunes, snobby posh girls and flamboyant boys. We are introduced to the history of the school, the various teachers, classmates and their bodyguards, various secret passages. There is a lot to enjoy in this book and I found myself wanting to get to bed to read more every night. Howwwwwwwweverrrrrr, there was a certain first-drafty feeling to the whole thing. There were various typos and rogue line breaks in my review copy- which is fine, it's an unedited proof- but I rarely see so many in a bound review copy. I felt like certain details weren't given time to be explored or were presented and then forgotten about. We only spend a couple of pages at Lottie's home, so those step mum and best friend dynamics aren't super solidly set up. Lottie climbs through some kind of secret tunnel in an art cupboard and overhears a conversation. I reckon she could've overheard a conversation without a secret tunnel, or let's use that secret tunnel a whole lot more, also why is there a secret tunnel in the art cupboard? Let's talk about that secret tunnel! Lottie also walks through a river and goes underwater to find another secret tunnel with Ellie? They get all wet?? Nobody, including the teachers, knows who the secret princess is, but all the teachers know that Lottie is there on a bursary, so presumably they've figured she isn't the princess after all? Lottie gets her phone back at the Christmas holidays (there's a no-phones-during-term-time rule) but has no signal in her room, and then at the end of the school year talks about finally getting her phone back and making a call in her room. I mean that is pernickety but it bothered me! What was all that code breaking about eh? Was it just about the founder? I thought Binal was letting them know that she knew about the princess thing? No? Also the headmaster taking a back seat and letting his female colleagues be the voice of the school?? Give them the headmaster job then surely?? Overall, I actually thought it was a great idea, but I just wish it had felt a little less rushed. Maybe a little bit of restructuring and attention to detail could've ironed out some of the obvious issues. I thought the pacing was pretty good, we raced through the school year so we got a fair bit of development of Lottie's new friendships. I thought the world building of the school and all its intricacies was cool, although I lost sense of this as the book progressed. And naming the role of royal stand in 'Portman' just HAS to be because of Natalie Portman's role as Padme/Princess Amidala in Star Wars riiiiight? I thought that was clever! 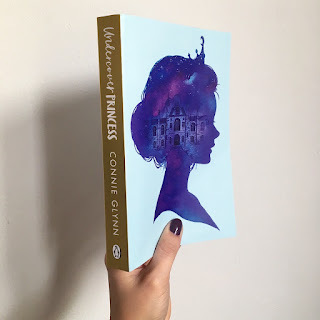 I'm hoping the next books in this series get more of a polish, and that Connie Glynn gets a bit more practiced at a flowing plot and attention to detail. In fact it made me think about the attention to detail, or lack thereof, in my own novel first draft, so it was a learning experience really! Undercover Princess is a great concept, but felt like a bit of a first draft to me. I received a review copy of Undercover Princess from the publisher in exchange for an honest review, which this is!